CAPE CANAVERAL, Florida -- NASA engineers will learn about five key operations of the Orion spacecraft when it is launched aboard a Delta IV from Kennedy Space Center, Fla. in December 2014. 1. Launch Abort System Separation – The launch abort system (LAS) is a key reason that Orion is intended to become the safest spacecraft ever built. In an emergency it could activate to pull the crew module and the astronauts it will carry away from the launch pad and the rocket in milliseconds. During launch, the 904-pound LAS jettison motor has to perform flawlessly. If it doesn’t get rid of the LAS 6 minutes and 20 seconds into the mission, there will be no landing – the LAS protects the crew module during ascent, but to do so, it blocks the parachutes that allow Orion to safely splashdown. The Launch Abort System separation is just the first of 17 separations or jettisons that have to happen exactly as planned for the mission to be successful. 2. Parachute Deployment – For EFT-1, Orion will travel 3,600 miles above the Earth so that when it performs its deorbit burn, it will descend back into the Earth’s atmosphere at almost 20,000 miles per hour. Before it splashes down in the Pacific Ocean, it needs to slow down to 1/1000th of its entry speed – a relatively gentle 20 miles per hour. 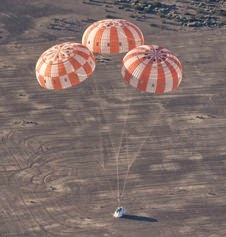 Earth’s atmosphere does its part to put on the brakes, but to make landing survivable, Orion relies on its parachute system – primarily two drogue parachutes and three massive mains that together would cover almost an entire football field. They’ve been tested on Earth; test versions of Orion have been dropped from airplanes with a multitude of failure scenarios programmed into the parachute deployment sequence in an effort to make sure that every possibly problem is accounted for. But the sheer number of possible problems to be tested indicates how complicated the system is – each parachute must deploy at the exact right time, open to the exact right percentages in the exact right stages, and be cut away exactly as planned. And no test on Earth can exactly simulate what the spacecraft will really experience on its return from space. module as it enters the Earth's atmosphere. 3. Heat Shield Protection – Before the parachutes even get a chance to deploy, Orion has to make it safely through Earth’s atmosphere. 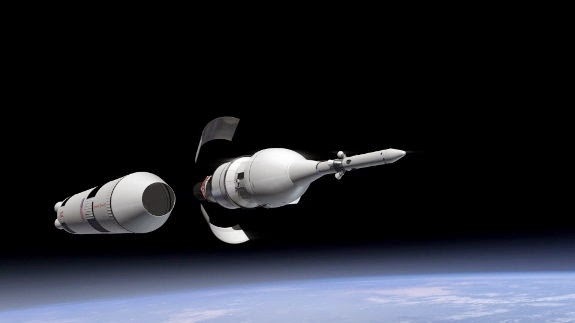 The reason that Orion is traveling so far and coming back in so fast is to give the heat shield a good workout – the idea is to get as close as possible to the temperatures Orion would experience during a return from Mars. At the speed it will be traveling, the temperature should reach almost 4,000 degrees Fahrenheit. At that same temperature, a nuclear reactor would melt down. Standing between the crew module and all that heat is no more than 1.6 inches of Avcoat, a material that’s designed to burn away rather than transfer the temperatures back to Orion. Some 20 percent of the Avcoat will erode during the spacecraft’s journey back to Earth, and although it’s not the first time the materials has been used for this purpose, at 16.5 feet wide, Orion’s heat shield is the largest ever built. Technicians filled with Avcoat each of the 320,000 honeycomb cells that make up the shield’s structure by hand, then machined them to the precise fractions of inches called for by the design. Getting it exactly right is all that will get Orion through one of the most dynamic periods of its mission. 4. Radiation Levels – Traveling 15 times farther into space than the International Space Station will take Orion beyond the radiation protection offered by Earth’s atmosphere and magnetic field. In fact, the majority of EFT-1 will take place inside the Van Allen Belts, clouds of heavy radiation that surround Earth. No spacecraft built for humans has passed through the Van Allen Belts since the Apollo missions, and even those only passed through the belts – they didn’t linger. Future crews don’t plan to spend more time than necessary inside the Van Allen Belts, either, but long missions to deep space will expose them to more radiation than astronauts have ever dealt with before. EFT-1’s extended stay in the Van Allen Belts offers a unique opportunity to see how Orion’s shielding will hold up to it. Sensors will record the peak radiation seen during the flight, as well as radiation levels throughout the flight, which can be mapped back to geographic hot spots. 5. Computer Function – Orion’s computer is the first of its kind to be flown in space. It can process 480 million instructions per second. That’s 25 times faster than the International Space Station’s computers, 400 times faster than the space shuttle’s computers and 4,000 times faster than Apollo’s. But to operate in space, it has to be able to handle extreme heat and cold, heavy radiation and the intense vibrations of launches, aborts and landings. And it has to operate through all of that without a single mistake. Just restarting the computer would take 15 seconds; and while that might sound lightning fast compared to your PC, you can cover a lot of ground in 15 seconds when you’re strapped to a rocket.